In case you didn’t know, today the much anticipated X-Men Origins: Wolverine is premiering. Fan will get to know more about Wolverine and his past. Other mutants not seen in previous X-Men movies are also introduced in this film. While reading an article about a special screening of Wolverine a few days ago I noticed they mentioned American Idol season 8 ex-contestant Scott MacIntyre. He was present at the world premiere in Tempe Arizona along with the stars of the movie like Hugh Jackman, Liev Schreiber, Ryan Reynolds, Lynn Collins, Taylor Kitsch and will.i.am . I guess Scott is a star now. Know what you’re thinking ‘but isn’t Scott blind?’ Yes that’s what I thought too. He may not be able to enjoy all the special effects but I’m guessing he must be a Wolverine fan? 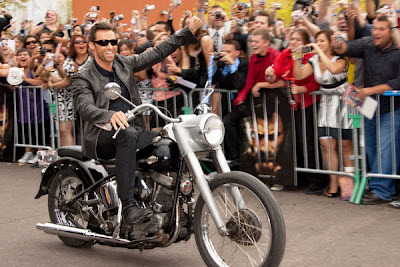 Here is a photo of Hugh Jackman arriving at the wold premiere in Tempe, Arizona on his Harley Davidson.